Is Your EHR Platform Giving You Headaches? If so, you’re not alone. Many physicians are overwhelmed by their electronic health records systems. We can help your practice stay on top of the latest healthcare news, rules, regulations and trends. Subscribe to stay current and up to date on important matters that will impact your practice. (To subscribe to our blog click here). A new study shows that for every hour a physician spends with a patient, they spend an additional two hours on EHRs and administrative tasks. While EHRs were designed to be more efficient, many things actually take longer in the EHR than they do on paper. For example, a simple flu shot takes 32 clicks on some EHRs to document. EHRs are not only time consuming, they also strain relationships. Many doctors are feeling burnt out due to the strain EHRs place on their relationships with patients. 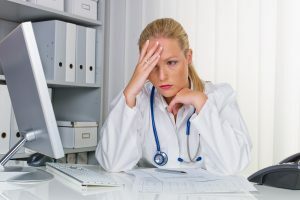 EHR platforms have led to numerous patient complaints in many practices, as many patients don’t feel that they are getting their physician’s undivided attention. Many doctors are upset that this technology is hurting their relationships with patients. Physicians strive to deliver quality care. Often, EHRs are seen as unnecessarily getting in the way of providing this care as physicians must devote more time to EHRs than patients. EHR vendors will hopefully take advantage of innovations that would allow physicians to provide more attention to their patients. We tell our clients that they must make an effort to continue to put patient relationships first and make sure they choose an EHR that aligns with their patient care approach. We can help you make sure your EHR vendor fits your practice needs. We advise our clients and negotiate with vendors. We publish vital information on health law topics and news every Wednesday and Friday. To get this important information delivered directly to your mail box, click here to Subscribe. Do you need help staying current and compliant with the latest laws, rules and regulations? We can help. To contact us about your new government rules and regulations, your practice’s risk assessment, or about your other legal needs: CLICK HERE.